The Reverend F.W.G. Gilby, O.B.E. 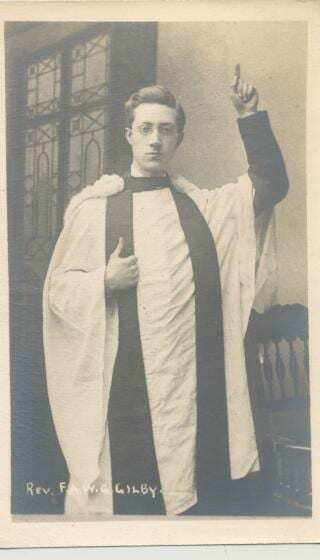 Son of “deaf-mute” parents and a missioner to the deaf, Frederick Gilby was born in North London on 3rd of July 1865. He was educated at Bishops Stortford and Shepton Mallet in Somerset. From the age of eleven he was interpreting for the Deaf in public. In 1883 the Royal Association for the Deaf and Dumb made him a student-missionary and he went on to study at King’s College London and Durham. Marrying in 1892, the same year he was ordained, Gilby moved back to London and on the death of the Rev. Rhind (see entry for the Jewish School) became minister for the Deaf church St.Saviour’s in Oxford St, which was demolished in 1923. After various moves he went to Bath in 1928 as a missioner to the Deaf, then was encouraged to carry on similar work in South Africa for 2 1/2 years. Although he returned to England to retire, the need for a Deaf school in the West Indies once more drew him abroad, and in both Jamaica and Trinidad he founded schools for Deaf children. When his wife died in British Guiana he returned to England at the age of 79, marrying his cousin Edith Gilby in 1945. He died in 1949 and is buried in Woking’s famous Brookwood cemetry. The Rev. F.W.G. Gilby as sign-maker. British Deaf Times, 1904, 1(5), 97-101. The Rev. F.W.G. Gilby, M.A. British Deaf Times, 1918, 15 (169-170), 1-3. Resignation of the Rev.F.W.G.Gilby, British Deaf Times, 1932, 29 (341-2), 53-4. GILBY, F.W.G. Seventy two years among the deaf and dumb. The author, 1937? Obituary. Ephphatha, 1949, 1(7), 3-4. Obituary. Somerset Diocesan Mission to the Deaf and Dumb 1949. p. 11.